This is a warning to other real estate people and homeowners to stay away from Samsung appliances. This is based on a combination of public information and personal experience which I am happy to share. Samsung is large multinational conglomerate. You may know them from their exploding phones. According to the internet, they sold exploding Galaxy S2’s, Galaxy S3’s, and Galaxy S4’s. More recently they decided to permanently end production of Galaxy Note 7’s because of phones exploding. Up until recently, however, I assumed that most of their products were well engineered and of generally high quality in order to be a global player in consumer products. Regardless, I figured anything that I purchased from a large, well-capitalized company would be backed by a standard warranty and reasonable customer service. On November 4, 2016, Samsung issued a recall for washing machines sold between 2011 to 2016 because they could EXPLODE. Specifically, excessive vibration caused by a mechanical failure could cause the lid on top-loading washing machines to become detached during operation and basically go flying. Some customer complaints reported that the explosion then led to catastrophic flooding and water damage in their homes. Fortunately, that did not happen to me and my two-month-old machine. Instead, I simply received the recall notice and confirmed through Samsung’s website that my model was affected. By coincidence, my washing machine simply stopped working around that same time. After filling with water during a cycle, the machine failed to drain and the cylinder stopped spinning. It was an inconvenience, but I figured I would call for a repair and the technician could address both issues in one visit. When I went to the website, there was also an option for a rebate. I figured waiting for a rebate and then ordering a new machine would take too long. Big mistake. Take the money and RUN. First, I tried their online chat but it was down, so I called their customer service line. I was connected to a call center in what I believe was India. They were a little slow, he kept saying they were having computer problems. I made sure he understood that my machine was broken and I also wanted to repair the recall defect. They gave me a date for a visit and told me someone would call back to confirm in the next 48 hours. When no one called, my wife reached out to them to confirm the visit. They asked for her ticket number. She looked at the email from Samsung but it had no ticket number on the email and the guy on the phone never gave me one. They then told her that our scheduled visit date that they had given us was invalid, as repair technicians don’t work on Sundays. So, we had to restart the process from the beginning. Now about three weeks later, our repair date finally came. A technician from the DISH Network, the media company, came to service our machine. He took a look but informed us that he was only equipped to handle the recall, no one told him about the other issues. He did not have the tools to fix the other issues, and could not fix the exploding lid problem until the other problems were fixed. He called his dispatcher and informed us that a more senior Samsung repair technician would call us in 48 hours to schedule a visit. No one ever called to schedule the return visit. The same day, my wife, who was livid, called Samsung to complain. This time she seemed to get a call center in the Dominican Republic. The person she ended up on the phone with seemed to speak limited English, had a poor audio connection, was an idiot, or all of the above. Every time she gave her name, phone number, the model number, and the serial number, he would repeat it back to her incorrectly. Fed up, she handed me the phone. I literally spent 20 minutes just repeating the spelling of my name to this guy, again and again. He then proceeds to tell me that my model was not affected, which I already know is false. I asked to speak to his manager. Unfortunately for us, while we were on the phone with these guys, the Samsung website was down, so we could not look up anything on the Samsung site ourselves. The guys at the call center also kept telling us they were having computer problems, and put us on hold repeatedly. We tried to explain to them that since Samsung could not repair our machine, we just want to take the rebate instead. Finally, after about two hours on the phone with them they said okay, we would get a check, and someone would call in 48 hours to confirm. Two days later we get a call from Samsung customer service. This time the call seemed to come from the US. The lady called to inform us that unfortunately we would not get any rebate. Once you choose the repair option you have to go to the grave with that decision, apparently. We asked her about the follow up visit the DISH technician said he requested. She said she had no knowledge of that. She then transferred me to the Technical Department to schedule a repair visit, which sounded like it was back in India. For the 100th time, I had to give this gentleman our model, serial number, phone number, email and spell my name. I asked why he did not already have this information, since I already gave it to them and this time they were calling me back (for once). He cited “computer problems”, and put me on hold multiple times. Once again, he promised someone would call in 48 hours to confirm. As of this moment, we are waiting for someone to call us back. It doesn’t matter where your call centers are located, as long as they are helpful and gradually advance the issue until it is resolved. But by having a call center literally as far away from Samsung’s offices as possible, it is virtually guaranteed that no one at Samsung feels fully accountable for this debacle. The canned answers, being put on hold, lack of flexibility, and broken promises show that either Samsung hopes to ignore its customers until the problem goes away, or are simply overwhelmed by the magnitude of their failure. My wife’s time is valuable and my time is valuable, and yet we have spent at least 5 hours (so far) dealing with Samsung’s defective product. 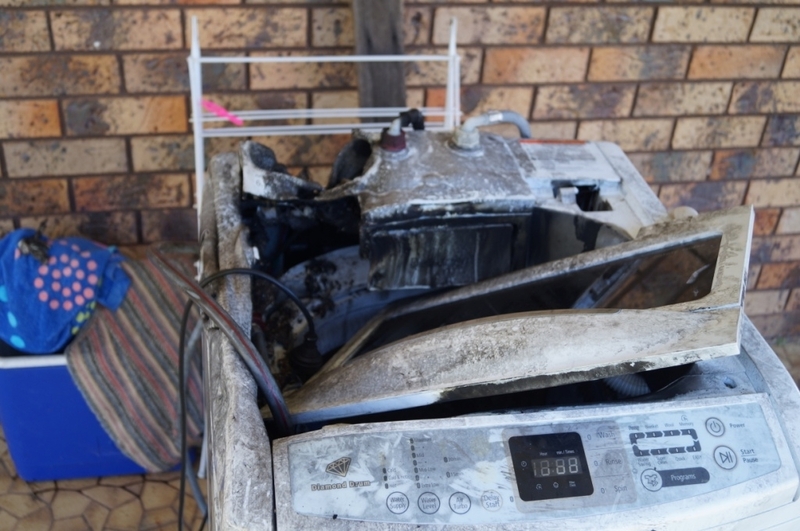 If you are a landlord or developer, the last thing you want to have to deal with is weeks of headaches fending off an angry tenant or homebuyer over a defective and potentially explosive washing machine that Samsung won’t fix in a timely manner. I can only imagine the stress if that machine also caused structural damage to your property, which Samsung is not going to voluntarily take responsibility for. The fact that multiple models of Samsung phones exploded and burst into flames, and now their washing machines are spinning catastrophes, shows that there is something fundamentally rotten at their core. And few companies can fail so miserably and do a complete 180 in short order, it just doesn’t happen. In other properties that I own or manage, I have had LG washing machines for two or more years and so far, those have been working well. LG is also a Korean company. Stay away from Samsung. May God help you if you don’t. NOTE: My wife believes one call center is in India. Samsung does have a presence in India, though I did not confirm if that was a call center. I guessed that the other guys were in the DR. Sure enough, there appears to be a company called Alorica that does customer service for Samsung out of Santo Domingo. ALSO: If you do choose the rebate option, they only offer you maybe 90% of what you paid. They will offer you 100% if you stay loyal to Samsung. I would speculate that 10% represents the commission they pay to their retailers which is a sunk cost, and/or that by withholding 10% they can entice people to choose the repair option or stay with Samsung.